Half or full pallet corrugated cardboard displays are an excellent method of presenting a sizable capacity of merchandise for sale in a retail store. When designed and manufactured properly they can be very hard to ignore, particularly with impactful and stimulating creative design. As a substantial sized display they almost ‘yell’ at customers to notice them and buy. 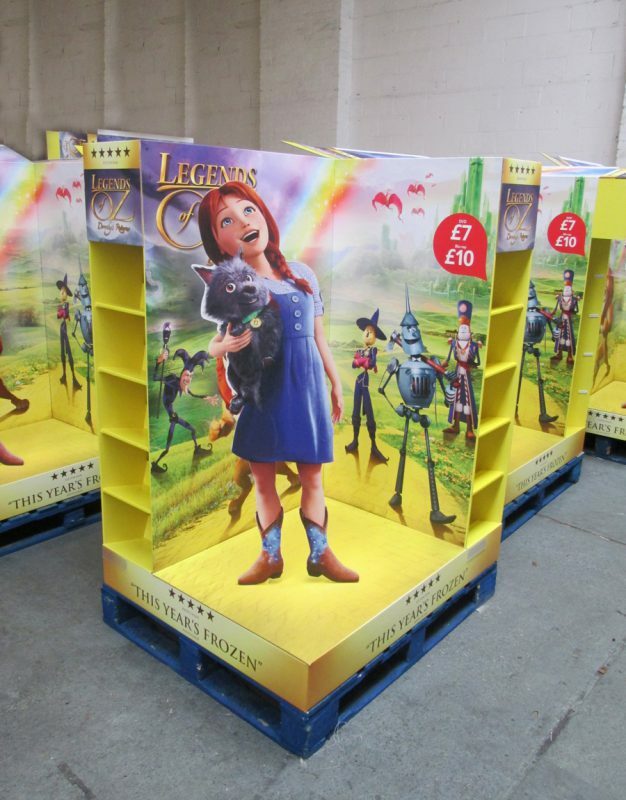 If required, your pallet displays could made to sit on plastic pallets with wheels specific to the relevant retailers. They can be shipped direct to store pre-packed and ready for the floor or flat packed ready for assembly. Most tend to be pre-filled so that the transit cover can be removed and it’s ready for work immediately. Once empty, if they’re not being refilled, your pallet displays can easily be broken down ready for recycling with the other corrugated cardboard. Your full and half pallet displays will be designed specifically for your needs including, if required, the inner fittings,, which can be designed around your particular product. All of this and there is no requirement need to order in large quantities. Contact us here to discuss your full and half pallet display needs.